What's Rebecca Reading? : Do you remember Ant and Bee? These books were originally published in the 1960s and 70s, and they have just been reprinted for a new generation to enjoy. They are only tiny (h95mm x w120mm), and each book introduces a new set of words. 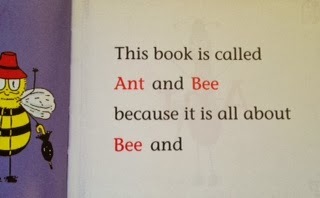 In the first book, Ant and Bee, we have 3 letter words. 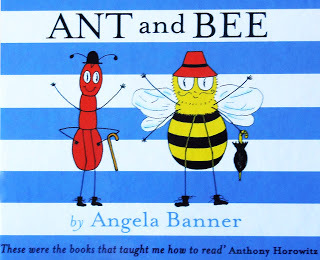 In More Ant and Bee there are 4 letter words and 3 letter words. In More and More Ant and Bee 5 letter words are added to the 3 and 4 words. They are designed for adults and children to share, the main body of the text is printed in BLACK, and is designed for an adult to read. The 3, 4 and 5 letter words are printed in RED, for the beginning reader to attempt. For each RED word there is also an illustration to accompany it. The truth of the matter is that the stories may not set the world on fire, but the concept is great and I do think that beginning readers will revel in the fact that there is a way for them to read part of the story.